Salesforce is a popular CRM software, but it’s relatively expensive and designed to be an enterprise solution for larger businesses. We compared 20 Salesforce competitors for contact and deal management, customization, user reviews, technical support, and overall affordability to determine the six best Salesforce alternatives for small businesses, including the best overall. Freshsales is a fully featured CRM with contact management as well as flexible lead and opportunity tracking that can be customized to your needs. Because it is easier to use and offered as a lower price point compared to Salesforce with many of the same robust features, we recommend it as the best overall alternative. 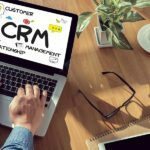 It’s best for those seeking a highly customizable and competitively priced CRM for small businesses. Freshsales offers a free forever plan known as its Sprout plan, which provides unlimited users with contact management capability. Additional functionality like deal management as well as advanced analytics are available in its paid plans, which range from $12 per user, per month to $49 per user, per month — a significant cost savings compared to Salesforce. The Sprout plan is Freshsales’ free entry-level plan and provides basic contact management functionality you would expect in a CRM software. It also offers rules-based scoring to help you better prioritize lead follow-up as is found in Salesforce’s Professional plan and web-to-lead capture forms that can help speed up the data entry process. This feature is also not found in any of the Pipedrive plans. However, the Sprout plan lacks many of the more robust opportunity management features and email tools found in the paid plans. It also lacks the website visitor tracking feature found in Zoho CRM’s free plan. For this reason, the Sprout plan is best for businesses that are looking for an affordable tool for managing their contact relationship details and little else. The Blossom plan costs $12 per user, per month, which is still half the cost of Salesforce’s Essentials plan. In addition to helping you manage your contact relationships, the Blossom plan offers opportunity management, bulk emails with templates, and email tracking. It also lets you dial contacts and log your phone call activities without leaving the tool, which is a feature not found in Salesforce unless you pay an additional fee for an upgrade. It also includes lead scoring, which is only found in Salesforce’s $75 and up per user plans. However, the Blossom plan does not include team management functionality like the other tiers do. It’s also missing the ability to create multiple pipelines like the comparably priced plan from Pipedrive. Therefore, the Blossom plan is best for individuals or highly independent sales teams that want to track their calls or send mass emails. The Garden plan provides the team management functionality that the Blossom plan lacks for $25 per user, per month. It also automates the lead process by allowing lead assignment and routing similar to what Salesforce offers in its Professional plan. The Garden plan does not, however, allow you to create custom sales activities as you can do with the Estate plan, nor does it provide time-based workflows or include a dashboard. You can create multiple pipelines, essential for businesses with different sales teams, such as inside and outside sales, and product lines like service and products. This feature is only found in Salesforce’s higher-priced plans. For this reason, the Garden plan is best for businesses that have multiple teams with different pipelines. It is also best for those who are disciplined when it comes to setting manual workflow reminders. The Estate plan includes dashboards as part of its reporting features but extends the tool’s contact management and lead scoring functionality to include contact activity on your website. The advanced reporting and forecasting found in this plan are only found in Salesforce’s $150 per user, per month plan. The Estate plan costs $49 per user, per month, which is still more affordable than Salesforce’s Professional plan. The integrations with Freshworks’ relatively low-priced suite of products like service and calling also make this plan stand out from Salesforce. This makes it a good fit for business-to-business (B2B) sales teams with long sales cycles that want to better utilize their website as part of their lead prioritization strategy. Contact record view. Image courtesy of Freshsales. Unlike Salesforce, Freshsales lacks the ability to issue quotes, manage orders, and invoicing directly in the tool. Nor does it include pricing books, which is a feature Zoho CRM provides, or product statistics like Pipedrive does. For this reason, Freshsales may not be the best alternative choice for businesses that manage inventory like retail or distribution. Freshsales users like the deals page and how Freshsales displays the entire sales process. They praise the customer service for technical support and how easy it is to customize the CRM. However, they give the tool lower marks for the quality of the standard reports and have complained the software can be slow depending on internet connection. You can read more in-depth reviews on our Freshsales review page. Freshsales is a great alternative to Salesforce based on functionality and cost. It can also help you manage your relationships with very little setup time and without the need to employ someone with an advanced degree in CRM. Freshsales offers a free forever plan, but you can also give the professional features a try with a risk-free trial. Click here to get started for free. Pipedrive is a competitively priced CRM designed to simplify the sales process. Pipedrive’s visual pipeline management gives you the ability to see what’s in your sales pipeline at a glance and lets you drag-and-drop prospects and clients from stage-to-stage. This makes it easier to track, understand and manage your deals, making it best for individuals or organizations looking to manage contacts through a visual, customizable sales funnel. Pipedrive offers three plans which range from $12.50 per user, per month to $49.17 per user, per month. This pricing makes the product more affordable than Salesforce, although not as economical as Freshsales. Pipedrive does, however, offer a free trial, giving you the opportunity to test it out before you buy. The Silver plan costs $12.50 per user, per month and includes Pipedrive’s signature visual pipeline homepage as well as contact management and configurable reports. Unlike Salesforce, Pipedrive is an easy to customize CRM, even in its entry-level plan, giving you the option of creating a unique and unlimited pipeline process to fit the needs of your business. Compared to Freshsales, adding deals takes fewer clicks to create and then drop in the appropriate stage. However, the Silver plan lacks the built-in scheduler and email template functionality found in its higher-tiered plans. It also lacks the lead scoring feature found in the plans from Freshsales. As a result, the Silver plan is best for businesses that are looking for a way to better manage their leads as well as their contacts, or those who want a software program that is tailored to their individual processes rather than being forced to adapt their processes to the tool. The Gold plan adds email tracking capability to Pipedrive’s contact management platform as well as a meeting and task scheduler not found in the Silver plan. It also provides account insights, which can help you better focus your follow-up efforts on the leads that are almost ready to buy. Like Salesforce, it also provides insights into your products, such as sales splits and average discount. This feature, however, is not available in Freshsales. At $24.20 per user, per month, the Gold plan is best for teams that want to take advantage of Pipedrive’s visual pipeline and require additional analytics. It is also best for those businesses like high-volume start-up companies that are prospecting and need to stay organized with the with a built-in scheduling tool. The Platinum plan offers the same features as the Gold plan but also includes sales forecasting functionality and advanced reporting features for $49.17 per user, per month. There’s also a goal-setting feature that’s not found in either Salesforce or Freshsales. Like Salesforce’s Professional plan, the Platinum plan lets you set specific permissions based on roles, giving you more control of what your team needs to do or see. The plan also gives you access to live phone support, and your data is hosted in a dedicated private environment. As the Platinum’s chief benefit over the less expensive plans is its additional analytics, role-based permissions and support, it is best for hierarchical teams. Because of its dedicated secure environment, it is also best for businesses in industries with sensitive data like financial and medical. Pipeline example. Image courtesy of Pipedrive. Pipedrive lacks Salesforce’s lead assignment and lead-based routing functionality, which makes it less viable to Salesforce for account-based sales requiring multiple points of contacts. While leads can be prioritized based on time since the last contact and priority labeled, there is no lead scoring feature like what you find in Salesforce, Freshsales, or Zoho CRM. Pipedrive also lacks a mass marketing email feature like those found in Salesforce and Freshsales. While Pipedrive may not be as feature-rich as Salesforce, what it does, it does well. Users of the software praise its user-friendly interface, its available integrations with other third-party tools and its short learning curve. However, they have reported that the tool could be improved with additional customer filtering functionality based on past sales and more robust webhooks. You can read more about Pipedrive and what other users are saying on our Pipedrive review page. Pipedrive simplifies the sales process while giving you a means of managing your relationships. While other tools require several clicks to navigate deals and locate specific customer activities, Pipedrive organizes in easy-to-digest visual homepages. You and additional team members can try out Pipedrive’s visual pipeline risk-free. Click here for a free trial. 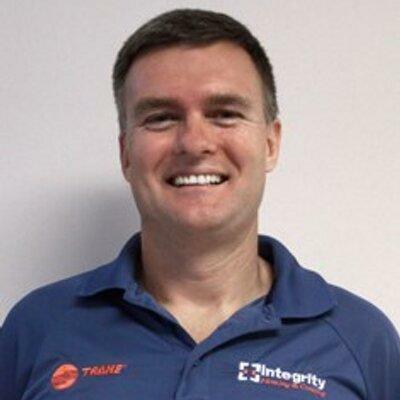 Insightly is a robust, competitively priced CRM that includes project management functionality, something that Salesforce lacks without integrations with third-party apps. This enables you to manage your prospects, deals, projects milestones, and vendor contacts. Therefore, it is a great solution for business owners looking for a Salesforce alternative with both contact and project management capabilities, such as interior designers, travel agents, and publishers. Insightly has two pricing plans: $29 per user, per month and $49 per user, per month. This pricing puts Insightly on par with Salesforce’s entry-level Essentials Plan but is less expensive compared to Salesforce’s Lightning Professional. If you will only have one to two users, Insightly offers a completely free option. Click here to try it out. At $29 per user, per month, Insightly’s Plus plan gives users the ability to manage contact relationships after the deal is closed with its project management functionality. It can add and manage 100,000 records and send 2,500 bulk emails a month. Like Salesforce, leads resulting from those contacts and marketing messages are then tracked and managed through a sales pipeline process customized for your business needs. The Plus plan, however, does not include any of the lead assignment rules, shareable account insights cards, dashboards or workflow automation found in the Professional plan. For this reason, it is best for solopreneurs, highly independent sales representatives or those with a sales process that cannot be automated. The Professional plan increases the number of records you can manage to 250,000 and doubles the amount of bulk email that can be sent out each month per user while costing $49 per user, per month. The Professional plan lets you customize your dashboard. It also gives you the ability to assign role-based permissions and automate workflow tasks like Salesforce’s Lightning Professional plan does, but at a lower price point. 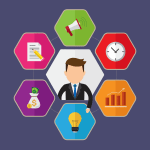 The Professional plan is best for teams of more than one individual that want to send more marketing messages or tailor the dashboard data to fit their unique business needs. It is also a good fit for sales managers who would like to limit what their teams can do or see based on roles. Managing the writing of this article as a project. Image courtesy of Insightly. While you can manage your projects within Insightly, the tool does not offer product pricing books and does not include a means for managing quotes and order. This puts the tool at a disadvantage when compared to Salesforce for businesses that conduct a lot of retail or product transactions. If managing products is important, consider Pipedrive as an alternative. We use Insightly ourselves and appreciate the ease in which contacts can be added to the database directly from a native email client as well as its ability to manage the projects in our pipeline. Other users like the ease in which fields can be added and reports can be created. However, use of the tool does require many clicks to navigate to specific record information. You can read more about Insightly on our Insightly review page. You can use Insightly to coordinate internal tasks and vendor relationships as well as the activities needed to close a sale. Insightly knows that relationships continue well beyond a deal’s close, which is why its project management functionality is such a benefit. Even better, it gives you a chance to try out its Professional plan for free for 14 days. Click here to get started for free. Zoho CRM has many of the same features as Salesforce but at a fraction of the cost. 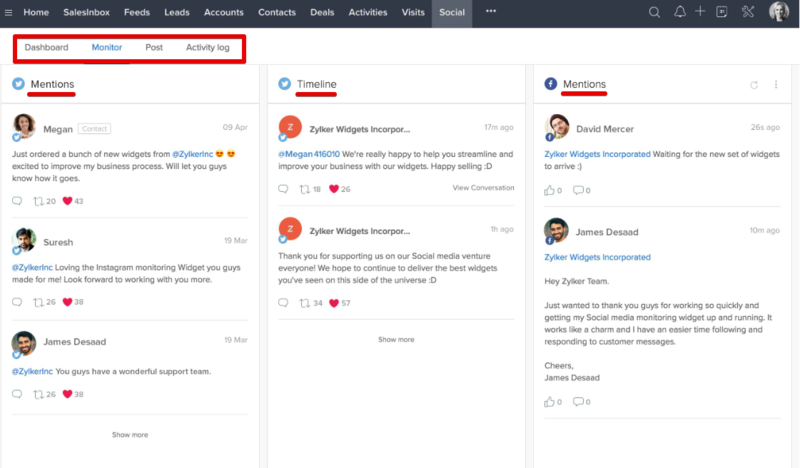 Further, it allows you to incorporate social media into your relationship management with additional sales channels for Facebook and Twitter, which you won’t find in Salesforce’s sales CRM. This makes it ideal for sales teams who prospect on social media sites. Zoho CRM offers a free plan for up to three users, which includes contact and opportunity management like Salesforce. Additional functionality and customization are offered through its paid plans ranging between $12 per user, per month and $20 per user, per month, a significant cost saving compared to Salesforce. Click here for a free trial. Zoho CRM’s Free plan supports up to three users and includes lead and contact management. It also has additional unique activity tracking features like phone logging and social media connections, which are not found in Salesforce and other free plans we reviewed without incurring additional add-on fees. With the free add-on version of Sales IQ, you can track website visitors — a feature not found in Salesforce or Freshsales. The Free plan, however, lacks the ability to route leads to specific users, manage orders or customize the interface. Therefore, the Free plan is best for teams of three or fewer that need activity and deal tracking but little software customization. It is also best for teams that manage their quotes and orders through another accounting tool. The Standard plan costs $12 per user, per month and allows users to add up to 10 custom fields and create up to 100 custom reports, which can then be scheduled and delivered to users daily. Like the Free plan and unlike Salesforce, the Standard plan integrates with Twitter and Facebook. It also allows you to send bulk emails, tracks website visitor interactions and provides sales forecasting and email insights. The Standard plan is, therefore, best for sales teams who want more insights into a lead’s behavior as well as being able to track multichannel communications like an ecommerce business. 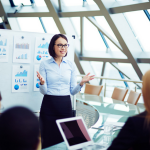 The Standard plan is also a good fit for groups of more than three sales team members. The Professional plan offers similar price book and order management functionality found in Salesforce but costs only $20 per user, per month, making it a much more affordable alternative. The Professional plan includes access to Zoho CRM’s proprietary SalesSignals, which automates lead scoring and helps you prioritize lead follow-up better. It also lets you add up to 150 custom fields per module. Its custom field offering and conditional follow-up rules that can be tied to CRM field updates make it a great alternative for teams like B2Bs with multiple products looking for either a tool with a high degree of customization potential or workflow automation. The Professional plan is also best for those who would like to capture leads directly from social media. Social media monitoring. Image courtesy of Zoho CRM. The only major feature that Zoho CRM is missing when compared to Salesforce is the ability to register leads with partners. This is an important feature for businesses that work with channel partners and need to assign and track leads with their partners. Zoho CRM users report the tool makes it easy to customize, track prospects, and set future tasks. They say data is easy to import from existing CRMs making the switch less painful. However, they do say that technical support could be improved. Fixes and new features are slow to roll out, and the user interface could be easier to navigate. For more user reviews, you can visit our Zoho review page. Zoho allows you to engage with your contacts on whatever channel works best for them. Zoho CRM’s customization and extended integration make it a great solution for teams that depend on being able to adapt their sales processes to match the next social media trend. Best of all, you can give Zoho CRM a try as long as you would like. Really Simple Systems has three tiers that range from free to $30 per user, per month as well as email marketing upgrades between $22 and $46 per month. With Salesforce, many of these email marketing upgrades like bulk email campaigns are included in their tiered pricing. This makes Really Simple Systems ideal for price- and feature-conscious businesses that only want to pay for the things they intend to use regularly. Really Simple Systems offers a free plan for up to two users, which includes contact management, and a product and pricing book. Additional storage or users can be added by upgrading to one of its two paid plans — $14 per user, per month and $30 per user, per month. Marketing upgrades cost a flat $22 to $46 per month. The major difference between Really Simple Systems’ Free plan and its paid plans is the available file storage and the ability to add on one of its two optional email marketing feature upgrades. With the free plan, you can import and export contacts, similar to Salesforce, and track the status of leads as they progress through your pipeline. You can also manage your product’s price books. However, the free plan is limited to two users. For this reason, Really Simple Systems is a great alternative for cost-sensitive solopreneurs who do not need email marketing tools. It is a CRM tool that lives up to its name by offering really simple contact relationship management. For $14 per user, per month, the Starter plan offers all of the same features as the free plan but also logs emails without having to purchase either of the email marketing upgrades. The marketing upgrades cost between $22 per month and $46 per month and provide features like those found in Salesforce, including email tracking, templates, and bulk email. Unlike Salesforce, however, those prices are not tied to the number of users. The Starter plan is best for teams that don’t need a lot of bonus features like built-in phone dialers, web-to-lead capture forms, or widgets that work in the background like the plans offered by Freshsales and Zoho CRM. It is designed for businesses wanting to manage their contact relationships and only pay for the features they intend to use. The Professional plan has all the same features as the Starter plan, including the option to add on email marketing upgrades, while also letting you manage quotes. For $30 per month, data storage is increased to 5GB, and the Professional plan lets you assign role-based permissions similar to those found in Salesforce’s Lightning Professional plan. In addition to more storage and user permissions, the Professional plan gives users access to technical support via phone and through online training. This makes it a better plan for businesses needing more immediate assistance or those that intend to attach large files to their contacts or sales-related activities such as service-related B2Bs. Really Simple Systems is designed to provide small businesses only the tools they intend to use. Therefore, what it lacks in comparison to Salesforce will depend on what an individual is willing to pay for. Even with the optional upgrades, Really Simple Systems lacks Salesforce’s, Freshworks’, and Zoho CRM’s collaboration and team management tools. Really Simple Systems users report that it is a great CRM for start-ups due to the low cost and the number of instructional videos available online. They said it is easy to use and navigate. It speeds up workflow but starts to get pricey as you need more storage. We have a Really Simple Systems review page where you can find out more about what other users are saying. Really Simple Systems’ goal is to have users up and running in minutes so that you can spend less time trying to understand your CRM and more time growing your business. You can take advantage of the Free plan or sign up for a free trial of the Professional plan on its website. Less Annoying CRM is a CRM designed with simplicity of use in mind. It includes basic contact management and activity tracking but does not include Salesforce’s more complex features like web forms, email templates, opportunity insights or sales analytics. Even its pricing is simple, with no subscription tiers, making it best for those who need a no-frills Salesforce alternative with basic functionality. Less Annoying CRM costs $10 per user, per month, and there are no additional pricing tiers or optional upgrades to worry about. There is not an upfront payment, and you can add or remove users at any time. There’s a free, 30-day trial with no credit card required if you’d like to test drive it. 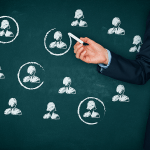 Less Annoying CRM’s low cost does come at the expense of features. Therefore, it cannot be considered a drop-in replacement for Salesforce but does still include many features to help you better manage your contact relationships. 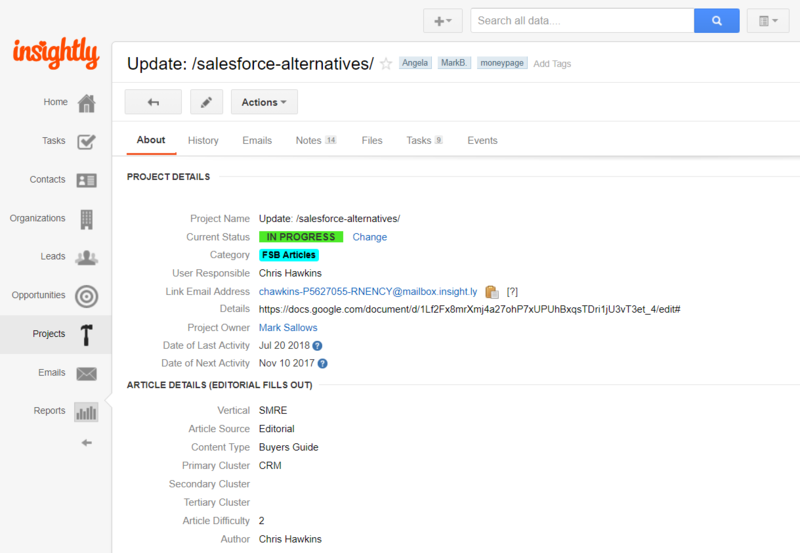 Just like Salesforce, Less Annoying CRM allows users to store notes, files, and tasks associated with a contact in a single user interface. Contacts are easy to import into the database and are searchable, giving you the ability to find the information you need to push a lead through the sales process. Unlike Salesforce, a salesperson’s calendar is built right into Less Annoying CRM, which keeps you from having to exit the tool. The calendars can also be shared with other users and can sync with Google Calendar. Less Annoying CRM shows the status of leads in a color-coded activity feed along with a deal’s estimated value and who it was assigned to. This helps you better identify what contacts need additional follow-up and what leads are progressing through your pipeline. While it is easier to identify a lead status in a tool like Freshsales or Pipedrive, Less Annoying CRM’s display is still easy to navigate and manage. Less Annoying CRM lets sales managers specify what data can be seen by specific roles or specific individuals within the company without having to pay more for the added protection. You can allow them to share leads and collaborate sales efforts or limit their access to only their own data. All users are granted their individual login so that you don’t have to worry about changing passwords constantly each time there is a staffing change in your organization. Less Annoying CRM gives users the ability to create custom sales processes as well as assign custom fields to contacts. All of these customizations can be done with a few clicks by an average user rather than force you to find someone with a background in information technology to do it for you at the database level. Less Annoying CRM lacks features such as web-to-lead capture found in many of the other Salesforce alternatives we considered. However, contacts can be imported easily via a spreadsheet. Less Annoying CRM also lacks the ability to send bulk emails or manage email campaign performance within your CRM nor does it give you the ability to manage quotes directly in the system. Users love the daily summary that helps them manage their tasks for the day. They report that data is easy to share with other members on their teams. They do say the tool could be improved if it synced with calendars other than Google or allow you to set a reminder for a task but have reported there are workarounds for both complaints. You can read more about what other users are saying on our Less Annoying CRM review page. Less Annoying CRM is a budget-friendly alternative specifically designed for small businesses due to its short setup time, ease of use and simple pricing structure. You can give Less Annoying CRM a try for free for 30 days by visiting its website. Salesforce is a full-featured CRM with lots of integrations, but its cost makes it uneconomical for many small business owners. It can also be difficult to implement and includes features that are often beyond a small business sales team’s needs. Therefore, small business teams may see a greater benefit by implementing another tool with more intuitive functionality at a lower price. Based on these criteria, we have determined that Freshsales is the best Salesforce alternative for small businesses. Freshsales was given this distinction as it offers the most direct one-to-one comparable features while providing additional customization capability at a more affordable price point. Salesforce is the granddaddy of sales CRMs for large enterprises and is likely to continue being so for years to come. However, the number of Salesforce competitors specifically designed for small businesses is on the rise, and, they are more suitable and better priced for small business needs. We recommend Freshsales as the best all-around Salesforce alternatives because it’s easy to set up and use, and sales reps love working with it. It also provides all the sales analytics you need to drive improvements to sales performance, and it’s a great value for the money. Before you consider buying, you can test it out for free. Thanks for the review of Really Simple Systems. However, you have omitted any details of our Enterprise plan which includes the features most comparable to Salesforce. This plan includes more advanced features for workforce collaboration and other advanced features. The Enterprise plan costs $46 per user per month. I am glad you found my review. This article is intended for small business teams who do not need an enterprise-level solution which is why I did not include that level of plan, offered by any provider, in my comparison. Thank you though for pointing out that Really Simple Systems does offer a plan for teams needing enterprise features as well as the information about its costs. Some great info & insights. I found Livespace CRM (www.livespace.io) to be the best for our company’s needs. It’s like Pipedrive but with more automation and better insights / analytics. And more available space. These are 6 great tools, but I’m sure that Livspace is an interesting competitor. Especially if you need to manage a B2B sales process – then you should definitely test Livespace! While Livespace.io did not make our list due to the base plan’s price and limited features, it is a product we will continue to keep in mind for future updates. Bitrix24 is great recommendation. I didn’t know that there are free full featured CRM that really do have almost all features that Salesforce. Keep up the great work. Thanks for reading and dropping in! Bitrix24 is a surprisingly feature-packed system, considering there is no cost. However, I will warn that some CRM functions acted somewhat buggy last time I tested them. I am really impressed by Bitrix24 and don’t understand why you did not put it as #1 option. Are you being compensated for sending traffic to Insightly? I was also very impressed by the social & collaboration tools on Bitrix24, but was not impressed by their CRM. For one, it’s very basic (no workflow automation, mass emails, Facebook/Twitter integration). It’s also somewhat buggy – For example, like most CRMs, you can link an individual to a company and vice versa. But with Bitrix, linking one won’t automatically link the other – you have to go to the company page and link the individual contacts manually. It also runs slower compared to other CRMs and takes a bit more scrolling to navigate through menus. To answer your second question, we do form a relationship with some our top picks after we write a review, and Insightly is one example. This has no affect on the content of our reviews, however, since we also enter research as a neutral 3rd party. You can read more about this process on our how we make money page, which is linked to at the bottom of every page. Some great info! I’ve used a few of them in the past (mostly Zoho), but some I had never heard of and I was intrigued. After some testing, none of them quite fit my needs though. Over the last few months, I’ve been using a new system that’s not on this list, called SuiteDash (https://suitedash.com) that I’ve been really satisfied with. It has CRM, project management, invoicing, and a ton of other useful features. Everything is really intuitive, and their support team has been incredibly helpful and responsive, sometimes even adding new features just for us! We’ve switched all of our business management over to SuiteDash now, and there’s no signs of us going back. Check them out at https://suitedash.com if you’re in the market for a reasonably priced and easy-to-use alternative to Salesforce. Thanks for the heads up and the comment. We will check out suitedash next time we update the guide.